The month of February brings up the daunting question of the year – “What do I get her for Valentine’s Day?” The GrillFather.com is here to solve that riddle with fantastic meal idea ready to grill for the love of your life: Grilled Salmon Collars. Featuring Japanese ingredients and flavors for an exotic presentation and taste, this salmon will speak words of love and passion. Nothing communicates appreciation and adoration like a home cooked meal under the stars, except for diamonds; diamonds are always good, but I digress. 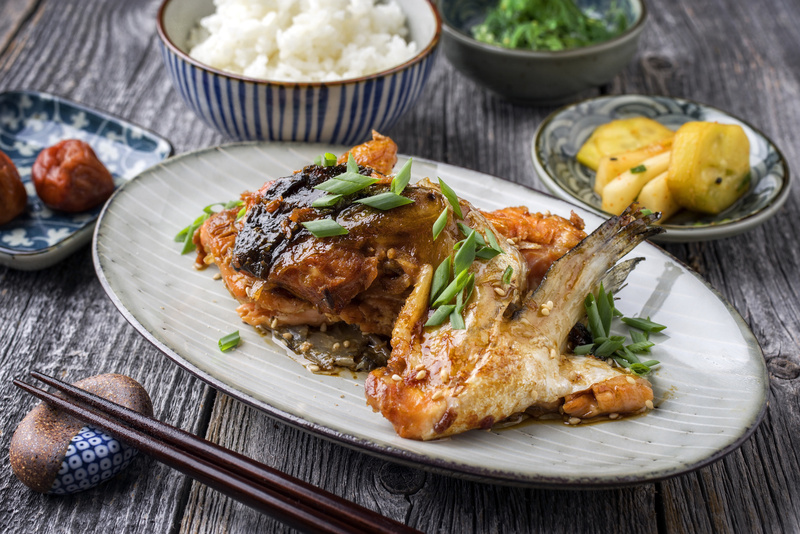 Begin preparing the marinade and sauce by reducing ginger, chle, garlic, mirin, soy sauce, sake, sugar, and water. Reserve a ¼ cup for basting, pour the marinade in a resealable bag or baking dish, and add the salmon collars lightly salted to marinate for 2 hours. Grill the marinated collars over medium heat on well-oiled grates skin side down basting continuously with sauce, and then flip after 5 to 7 minutes and grill for another 5 minutes. The finished collars reveal a deep dramatic color that is overmatched with light texture and moistness. So fire up the grill, don’t forget the chocolates and roses, and create the perfect meal for the perfect girl making a perfect date. Bring ginger, chile, garlic, mirin, soy sauce, sake, sugar, and 1 cup water to a boil in a medium saucepan. Reduce heat and simmer the mixture, stirring occasionally, until reduced by half, 15–20 minutes. Let cool. Strain through a fine-mesh sieve into a heatproof measuring glass or small bowl; discard solids. Set aside ¼ cup. Pour remaining sauce into a large resealable plastic bag. Season salmon lightly with salt and place in bag. Seal bag and turn salmon to coat. Chill at least 30 minutes and up to 2 hours (go the full time for the most flavor). Prepare a grill for medium heat. You want moderate heat for fatty fish like salmon so the fat can slowly render while the skin gets nice and crisp. Clean grate well with a wire brush. Just before you set salmon on the grill, fold up a paper towel and hold it with a pair of long tongs. Dip the paper towel in oil and wipe down the grates. Remove salmon from marinade, letting excess drip back into bag; discard. Grill salmon, skin side down, brushing occasionally with reserved ¼ cup sauce, until skin is lightly charred and crisp, 5–7 minutes. Turn salmon and grill until the other side is lightly charred (don’t brush this side with tare), about 5 minutes. Transfer salmon collars to a platter.